At a time when the quest for peace and harmony has become the watch-word among various warring communities the world over, from Northern Ireland to Bosnia and Palestine to Sri Lanka, and while whole nations are praying for peace, it is appropriate to examine the unique sanctity of that great haven of peace that glitters on the southern coast of Sri Lanka, the hoary sylvan shrine of Kataragama. It is hailed as the abode of Lord Skanda, the protector of Sri Lanka and great destroyer of asuric forces. It is hidden from our view behind the seven veils of the Kataragama Devale and is radiating mighty spiritual forces for the welfare of the world, through the yantra plate lodged in the sanctum sanctorum, through the purifying waters of the Menik Ganga that skirts the sacred shrine and through the peaks of the seven hills of Kataragama that dominate the landscape for miles around. The author, Marshall Govindan, states that he has been gathering material for this book for about two decades on a scientific basis since he got initiated into Kriya Yoga techniques at the International Babaji Yoga Sangam centre at Los Angeles in 1970. He has travelled during this period to India, Sri Lanka, Malaysia and Australia. In 1989 he was inspired by Kriya Babaji himself to write this book to introduce to the world the glory and greatness of the 18 Siddha Yoga traditions, from which Babaji synthesized and revived his Kriya Yoga techniques, and to propound to the public the approach to life and the worldview of Babaji and the 18 Siddhas that "all countries are my homeland" at a time when the world is locked in a self-destructive spiral. The author states that during his visit to Sri Lanka he had made several pilgrimages to the Kataragama shrine to ascertain the details of any records relating to the traditional story of Kriya Babaji's visit to Kataragama in 214 AD as a chela of eleven years of age called Nagaraj to meet his first guru the fabulously long-lived rishi siddha Bhoganathar (one of the 18 siddhas pertaining to the present cycle of the four yugas, namely Satya, Treta, Dwapara and Kali Yugas). Siddha Bhoganathar is credited with inscribing a mystical yantric geometric design etched into a metalic plate and its installation at the sanctum sanctorum of the Kataragama Devale. The term siddha is used here to denote a perfected human being. The author has prefaced these remarks in his book with a statement that much of the information about Babaji's visit to Kataragama in 214 AD and about his birth in South India in 203 AD were revealed by Babaji recently in 1952 to his disciple VT Neelakantan when he materialized in physical form on several occasions in the puja room of Neelakantan at No. 9, Surammal Lane, Egmore, Madras, and dictated verbatim to him the contents of three mystical publications which Babaji wanted him to publish for the benefit of the world. V.T. Neelakantan was a close friend of Jawaharlal Nehru and a student of Mrs. Annie Besant, the well-known theosophical leader. The birth of the child Nagaraj is reported to have taken place on Karttikai Deepam day during the ascendancy of the constellation (nakshatra) Rohini, as in the case of the birth of the child Krishna 3,500 years earlier. 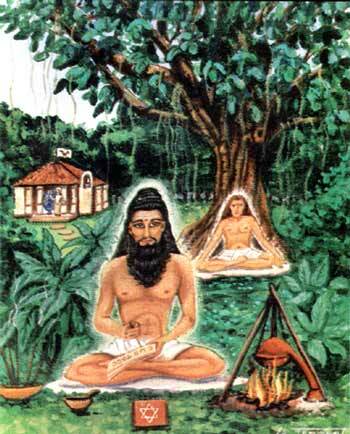 Regarding the sojourn of Kriya Babaji at Kataragama in 214 AD as a chela of eleven years of age called Nagaraj, the author states as follows: "Sitting under a large spreading banyan tree with him (Siddha Bhoganathar) for six months Nagaraj performed intense yogic sadhana particularly various dhyana kriyas into which he was initiated by Bhoganathar. The tapas was done for long periods without a break, initially for 24 hours and later for days, weeks and up to 48 days at a stretch. The various meditation kriyas unchained his mind from the limiting processes of the thinking mind, allowing his consciousness to expand and realize its identity with an undifferentiated absolute Reality." The author further states that on his visits to Kataragama he traced "the sacred spot where Babaji practised austerities under the large banyan tree. Unfortunately, some twenty years ago and insensitive man cut down this tree. A few days later this man went mad and hanged himself. 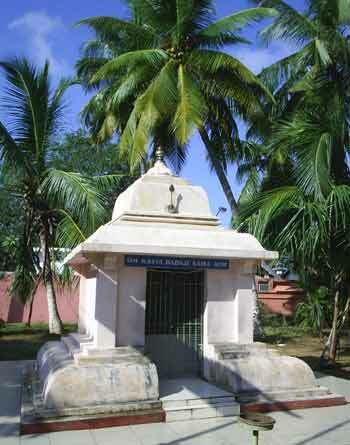 However, in 1985 a small shrine was built on this spot, which is near the front gate of the temple of Teyvanai Amman, Lord Murugan's consort and spouse in the Kataragama temple complex. The Teyvanai temple priest daily makes offerings in the Babaji shrine." The author thereafter continues to describe the journey made by Babaji back to South India and his visit to Cuttalam to seek the final initiation in Kriya Yoga from the legendary siddha Agastyar (who was Bhoganathar's guru), where he did intense tapas for 48 days and was blessed by Agastyar to go and settle down in Badrinath in the Himalayas and "become the greatest siddha the world had ever known' with the cells of his physical body completely divinised. (Babaji still appears at the Kumbha Mela held at Allahabad once every twelve years as a perennial youth of sixteen years of age, though nearly 1,800 years have elapsed since his physical birth in 203 AD.) Babaji is also known to have initiated the famous Hindu reformer Adi Shankaracharya into the mysteries of Kriya Yoga about the year 800 AD. The author finally adds that Babaji has made it his mission to assist suffering humanity in their quest for God-realisation. Usually he does so anonymously.  Those helped by him generally do not know the source of assistance. According to Lahiri Mahasaya (a disciple of Babaji), by simply reciting Babaji's name with reverence one receives a spiritual blessing. The author refers to an interesting facet of siddha Bhoganathar's life relating to his journey to China about 500 BC and transmigration of his vital body into the physical body of a Chinese who had relinquished it and being known thereafter by the name of Bo-Yan and later by the name of Lao-Tsu, and becoming the founder of the great world-renowned philosophy of Taoism and preaching it in China for about 200 years and then relinquishing the Chinese body and returning to India and then proceeding to Sri Lanka to install the sanctified yantra plate at Kataragama. The author of the book incidentally refers to a great yogi in whom Babaji had shown interest and states on page 76 as follows: "At Babaji's request, S.A.A. Ramaiah (a disciple of Babaji) wrote and published in 1982 a biography of a great master of yoga, Omkara Swami (who had helped Ramaiah in his yoga practice) entitled A Blissful Saint - Paramahamsa Omkara Swami. The preface of his book was written by VT Neelakantan. The writer of this article had the good fortune to meet this great master of yoga when he visited Sri Lanka in 1956 along with Yogi SAA Ramaiah and later invited him specially to travel down to Sri Lanka again in 1957 and arranged for him to perform a special yagam in Colombo and also visit Kataragama and other places in Sri Lanka and bestow his blessings on the people by his sonorous chanting of the OM mantra. C. Shanmuganayagam, Convenor, Thinkers' Forum, Meditation Group, Sri Lanka tells of meeting with the great masters of Yoga, Paramahamsa Omkara Swami and Yogi Ramaiah in 1956. The three met again in 1957, when the young man was invited to accompany them to perform a special Yagam in Colombo and also visited with them in Kataragama, where they bestowed blessings on the people by sonorous chanting of the AUM mantra. 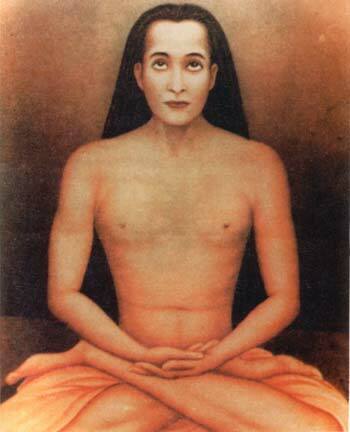 or write to the International Babaji Yoga Sangham: ombabaji@kriyayoga.org.